By Odin! That lil' piggy is back from the market?! Every time I stop writing my posts for a day, or two, or thirty, it seems I gain a new follower. I like the idea that a new person came to my blog and enjoyed a post, or two, or thirty, enough to think, "I bet he'll start writing his posts again." Well, my loyal new followers, today you are vindicated! A brand new, awe-inspiring comic of the day post to make you never question your following instincts again! 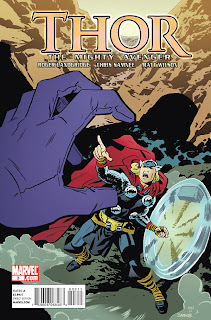 Much talk has come from a comic shop, or two, or...you get the point...about the early cancellation of Thor the Mighty Avenger. The book simply did not sell enough copies for Marvel to justify it's continuation...which is a damn shame. I compare it to when Conan got the Tonight Show and moved to 11:30. So many fans were stoked! Finally he was getting the crown jewel of late night because he earned it through creativity and longevity. It was great for long-time Conan fans who grew older and started to not be able to watch as often as they would like when Conan was on at 12:30. But unfortunately, fans took Conan for granted and just assumed he would be there for them when they decided to get around to watching. Every fan thought, "I can miss tonight, the Conan team will pick me up." Conan's rating sunk, and too did his show (Who talks like that? "and too did his show"...also, who quotes themselves?). Thor the Mighty Avenger, like Conan, had many fans when it came to words and conversations amongst friends, but they needed our actions to survive. They needed us, and we let them down. I...let them down. But all is not lost! Conan is back (on TBS) and better than he ever was on the Tonight Show. And Thor the Mighty Avenger, you ask by just saying the title of the comic but with an inquisitive tone...what is he up to? Well, I'm sure a hardcover collection of his 8 issue series will be collected soon and sell more copies than this realm has seen in some time. Or not. What do I care? I bought Thor the Mighty Avenger #3, and the rest, out of some comic shop dead-beat's old pull list he never picked up. do you get a discout from picking up abandoned pull lists? I have a request, if you do those. I would like to get your feelings on Wolvering and Jubilee #1. I enjoyed it. It might have been paced a little quick but it was good. Yes! My first request. One day back and I'm already on a role. I'll pick up the book and post about it within a couple of days. Oh, and they didn't give me a discount on the pulled books, but I do get a shop-regular discount. The Comic Bug in Manhattan Beach, CA always hooks up their community.